So I was walking across the office lobby just before Christmas and bumped into a former boss. "I have a quarrel with you," he said. "Just as I'm about to start my Christmas feasting, I read your story telling me to drink water before going to a party?" I told him I did not know what had come over me either. The story was about how not to overeat at Christmas. I had interviewed hospital dietitians, who offered all kinds of tips - from making festive food healthier to, yes, pre-loading with water before a feast. It kills the urge to eat. And it works. I've tried it several times. Normally, I love feasts. Big, elaborate ones, plates piled high, tables groaning with food, people groaning with pleasure as they inhale said food. So when did I become a party pooper? I guess all that eating became too much and I just do not want to do it any more. I still feast, but strategically and not every day. As we gear up for the relentless onslaught of Chinese New Year feasting, I confess I feel some anxiety. Already, I have had too many lo hei meals with endless courses of rich food. Will my resistance crumble when offered pineapple tarts, my absolute favourite Chinese New Year treat? Will I eat too many slices of bak kwa? Will I lose control and demolish a whole tub of kueh bangkit? So it is perhaps a good thing that I haven't found a pineapple tart this year that I really, really like. Recently, I walked through a large and popular Chinese New Year fair in a mall and was unmoved by the offerings. Imagine that. But a smarter strategy would be to pace myself and schedule lots of plain meals in between the elaborate ones, I think. So this week's recipe is vegetarian, just rich enough and not too decadent. I love mushrooms because many varieties have a meaty texture. Here, I stuff portobellos with spinach, panko crumbs, pine nuts and parmesan cheese. Leave out the cheese if you want it a little more austere, but it really does bind the filling together. Look for portobellos with deep caps, as they hold the mountain of filling a lot better. If, for some reason, you do not like mushrooms, you can use zucchini instead. Slice them lengthwise, use a spoon to scrape out the centre core, chop that up and add it to the filling. Brush the hollowed-out zucchini with the mushrooms, roast for 10 minutes, fill and roast again. 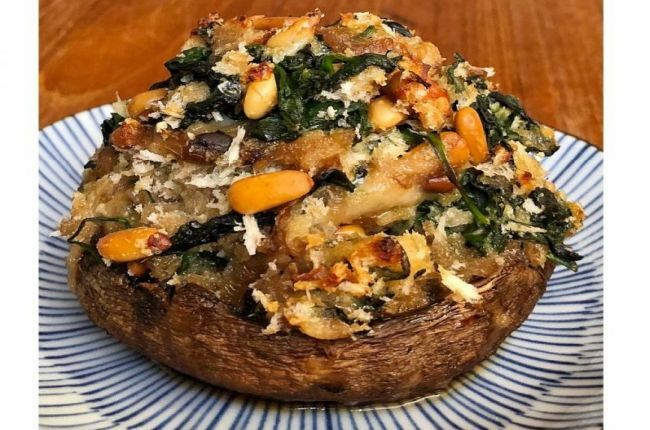 Two stuffed mushrooms make a filling meal for one, or serve them as a side dish for four people, alongside grilled chicken or fish. I am currently obsessed with grilling and eating fish collar, especially buri or hamachi ones. They're both yellowtail, but buri are larger. I get mine from the fish section of Japanese supermarkets. They are so easy to cook - rinse, dry, rub with salt and place in the oven in the grill setting and let the skin become blistered and crisp. It takes 15 to 20 minutes, depending on the size of the collar. Eat the fish with oroshi, which is grated daikon, doused with shoyu or ponzu. Take time to excavate the collar, there is so much meat lurking everywhere. A meal of grilled fish is entirely in keeping with the nian nian you yu vibe of Chinese New Year, and is delicious, especially with the abundantly stuffed mushrooms. I'm scheduling this very meal for Thursday because my sister, who will be in town, has pleaded in advance for a reprieve from the feasting. I know where she's coming from. And we are going to watch out for each other when we go visiting. And drink lots of water. 1. Preheat oven to 180 deg C.
2. Place the pine nuts in a pan without oil, set it over medium-low heat and slowly toast them, moving the pan constantly, until they become golden brown. Pour onto a plate and set aside to cool. 3. Chop the onion finely. 4. Heat a frying pan over medium heat, add the 1 Tbs of oil and the onion. Saute until the onion turns translucent. Add all the spinach and give the pan a good stir until the spinach has wilted. Add salt and pepper to taste. Pour the onion and spinach mixture into a large mixing bowl, together with the panko crumbs and parmesan cheese. Add most of the pine nuts, reserving a few for garnish. Using a large metal spoon, combine the ingredients in the bowl. Set aside. 5. Slice off the mushroom stems and use a damp paper towel to wipe off any dirt clinging to the mushrooms. Place them on a foil or baking paper-lined tray. Brush all over with cooking oil. Place in the oven and roast for 10 minutes. 6. Remove the tray from the oven. Divide the filling into four portions and heap it on the mushrooms. Sprinkle on the remaining pine nuts. Return the tray to the oven and cook another 10 minutes, or until the panko is golden brown. Serve.